genetic mutation between different races that lived on that island? 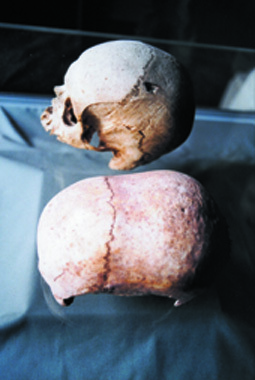 the discovery of this skull and the like at Hal Saflieni isn't accidental. given a serpent-like appearance, stretching the eyes and skin. were considered as being proof of a bond with the goddess. 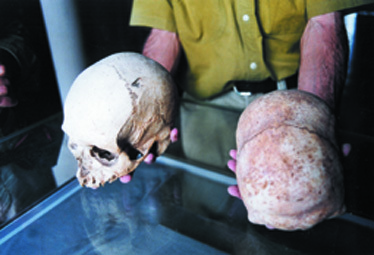 Even the other skulls we examined presented strange anomalies. originated from Sicily". We shall discuss this detail further on. community. Why such persistence in tormenting one's own body? than that of the local ethnic group, fair hair and a taller, heavier build. solar religion and even today in Malta the sun is called "Shem-shi". goddesses as divinities with faces of vipers and lengthened heads. These divinities will successively be associated to the "fallen angels"
Nile, dating back exactly from the archaic period of the Shemsu Hor. that, in Egypt and Malta, from archaic ages, survived till 2500 B.C. Moses is accepted, then the rest is history.